My article today is the eighth in a series of prompts that I hope might spark some creative expression in your kids, and maybe you too. Our first prompt was a general one, where we looked for something else to innovate on; our second took a poem as a model; the third used video as a prompt; the fourth started with something we liked; the fifth started with what if; the sixth looked to nature; and the seventh started with some story elements. 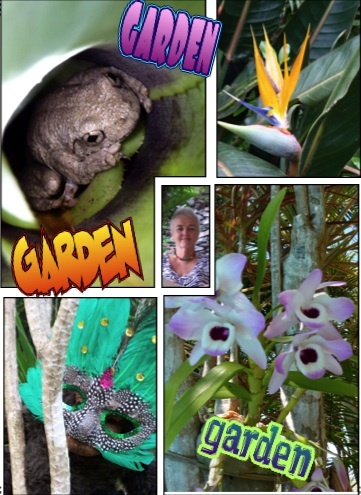 Guest author, Sandy Fussell, had many more wonderful ideas in her post, Becoming a Story Detective. I hope you and your kids will join me again today so we can all challenge ourselves to be more creative. A single word can be amazingly powerful. When you throw a pebble into a pond, the ripples extend way out to the edges. It's the same with a word - its influence grows as more and more people use it. With the right word or words, we can move mountains, open caves filled with treasure, and make the gaoler set us free. One of my favourite language activities to do with kids has always been to ask them for their favourite words. Getting kids to collect words, enjoy them and share them with others is a great way to extend their literacy skills. Today, we're going to choose a word to use as a prompt for some creative activity. The word can stand for an object, a creature, a feeling or an action. It can be any part of speech. You can decide to choose it deliberately, or let a random word adopt you. Random words might arrive via a an opened page and stabbing finger, or you could try a website like Save the Words. Once you have a word, open yourself to its possibilities. Play with the word. Write/type it in different fonts and colours, say it, sing it and savour it. 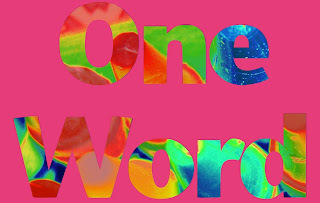 That one word might prompt a poem, a story, or a song. It might be the star of a poster or a collage. You could carve it, colour it, write it on a cake, or make it with play-dough. I set myself two challenges this time. The first was to make a poster about my word, "garden". It's spring here in Australia and my garden tells me I spend way too much time at the computer. So I grabbed some photos and made a poster with Comic Life, adding my word in a couple of different font styles and colours. You can see that poster at the top. Comic Life makes it too easy to call it a true challenge, but it was an enjoyable creative few moments. My second challenge was truly a challenge, however. I wanted to see if I could make letters transparent and fill them with another image. How exciting when I managed it! You can see the result in my lower image. I used Pages, Mac software I am growing to love. Another powerful activity to do with older students is to ask them to choose one word that reflects what they want for themselves that year. They could make that word part of a collage of their dreams and goals, or just spend time thinking about why the word is important to them. What one word do you choose? Using this idea today with my virtual classroom students! We will be heading over to Save the Words to discover a word to save and adopt (http://savethewords.org). Students will use this word as the basis for their story or as a portion of their story. Students will storyboard their story and then animate it with Domo Animate domo.goanimate.com. Thanks for the inspiration! I love the idea of using Domo that way, Kelly. Thanks for sharing!